Ada tool bagus nih buat yang pada doyan chating n ngeroom di Yahoo Messenger. YM chat image verifier berfungsi untuk grab kode untuk masuk room, jadi tidak perlu membuka browser lagi untuk memasukan kode verifikasi. Masukan kodenya kemudian klik submit. Thanks buat orang yang sudah membuat program ini, nice little program! Virus....benar-benar bikin pusing kalo komputer kita sampe kena virus, apalagi kalo virusnya ganas. Salah satu media penyabaran virus yang populer adalah melalui flash disk. Fungsi Autoplay yang ada di Windows XP makin membuat virus lebih mudah menyebar. Memang sih dengan Autoplay kita ga usah repot-repot klik-klik lagi, tinggal masukin flash disk or CD maka akan langsung play deh. Tapi justru disitulah virus akan memanfaatkannya dengan merubah autorun yg ada di flash disk sehingga akan langsung autorun virusnya. Jadi demi keamanan, lebih baik dimatikan saja fungsi autoplay di Windows XP. Klik Start >> Run >> ketik "gpedit.msc"
Kalau hal diatas sudah dilakukan, maka kalau kita memasukan flash disk ke usb port, tidak akan muncul apa2 (autoplay dimatikan), tapi soal mudah itu lah, tinggal masuk ke My Computer aja, masuk deh ke flash disk. Ini adalah sebuah program kamus kecil yang waktu itu gw dapet dari googling. 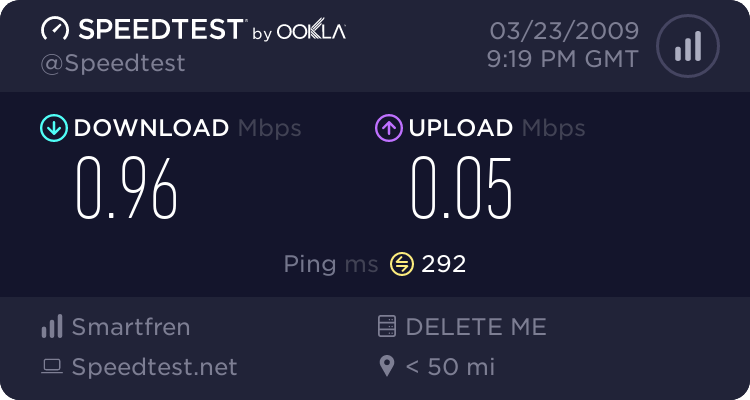 Tapi websitenya tempat gw download waktu itu malah sekarang sudah nggak ada, jadi sekarang gw pasang aja disini, mungkin masih ada yang membutuhkan. Program ini lumayan berguna dan ringan dijalankan di komputer. Glory Glory Man United adalah sebuah lagu utama para fans Manchester United. Lagu ini banyak sekali dinyanyikan terutama pada saat sedang menonton Manchester United bertanding. United Road (Take Me Home) adalah sebuah lagu populer yang banyak dinyanyikan oleh fans Manchester United. Lagu ini sebenarnya adalah hasil gubahan dari lagunya John Denver yang berjudul Take Me Home, Country Roads. Lagu ini terinsipirasi dari nama United Road, sebuah jalan yang berada di bawah tribun utara stadion Old Trafford. Setelah selama ini menggunakan IM2 Broom unlimited dan sudah mulai males karena speednya dah mulai lemot, maka gw memutuskan untuk mencoba Paket Jump dari Smart. Teknologi yg dipake namanya EVDO yg diklaim setara atau bahkan lebih cepat daripada 3.5G. 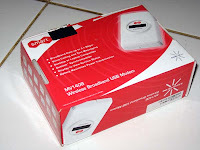 Modemnya Axesstel MV140B speed up to 3.1 Mbps. Selain modem, di dalem paketnya itu ada buku manual, CD driver, handsfree (bisa buat nelpon dan sms juga tapi bakal kena tagihan kalo dipake), pouch modem, serta batere modem dan chargernya. Kalau dibandingin ama IM2 sih, jelas lebih cepet ini dan full unlimited lagi tanpa batasan. Kalo melihat perkembangan sekarang, semoga aja tarif internet di Indonesia bisa makin murah. Udah ah segitu aja, gw bukan orang Smart dan ga ada hubungan sama sekali dengan Smart, gw cuma sekedar pengguna product Smart yang ingin berbagi pengalaman dengan teman-teman semua. Mafia Wars, sebuah aplikasi game di Facebook yang seru abis. Dalam game web base ini kita berperan sebagai mafia yang berperang dengan mafia lainnya. Untuk bisa menang peperangan kita harus mempunyai family yang besar dan kuat, untuk saat ini maksimal jumlah family mafia yang ikut berperang adalah 501. Di permulaan game akan ada pilihan character: Fearless (faster health recovery), Mogul (faster money) dan Maniac (faster stamina recovery). Untuk mendapatkan uang kita harus membeli property yang akan menambah uang kita setiap jam. Untuk menambah experience atau menaikan level, kita bisa melakukan job (menggunakan energy) atau dengan melakukan fight (menggunakan stamina). Ayo deh buat pengguna Facebook, main Mafia Wars, seru deh pokoknya. Add gw ya and buat orang Indonesia yang main Mafia Wars, jangan lupa gabung ke clan [MWI] ya, biar tambah seru mainnya. Berikut ini list lengkap command list buat Windows XP, mudah-mudahan berguna. • ANSI.SYS Defines functions that change display graphics, control cursor movement, and reassign keys. • APPEND Causes MS-DOS to look in other directories when editing a file or running a command. • ARP Displays, adds, and removes arp information from network devices. • ASSIGN Assign a drive letter to an alternate letter. • ASSOC View the file associations. • AT Schedule a time to execute commands or programs. • ATMADM Lists connections and addresses seen by Windows ATM call manager. • ATTRIB Display and change file attributes. • BATCH Recovery console command that executes a series of commands in a file. • BREAK Enable / disable CTRL + C feature. • CACLS View and modify file ACL's. • CALL Calls a batch file from another batch file. • CHCP Supplement the International keyboard and character set information. • CHKDSK Check the hard disk drive running FAT for errors. • CHKNTFS Check the hard disk drive running NTFS for errors. • CHOICE Specify a listing of multiple options within a batch file. • CLS Clears the screen. • CMD Opens the command interpreter. • COLOR Easily change the foreground and background color of the MS-DOS window. • COMPACT Compresses and uncompress files. • CONTROL Open control panel icons from the MS-DOS prompt. • CONVERT Convert FAT to NTFS. • COPY Copy one or more files to an alternate location. • CTTY Change the computers input/output devices. • DATE View or change the systems date. • DEBUG Debug utility to create assembly programs to modify hardware settings. • DEFRAG Re-arrange the hard disk drive to help with loading programs. • DEL Deletes one or more files. • DELETE Recovery console command that deletes a file. • DELTREE Deletes one or more files and/or directories. • DIR List the contents of one or more directory. • DISABLE Recovery console command that disables Windows system services or drivers. • DISKCOMP Compare a disk with another disk. • DISKCOPY Copy the contents of one disk and place them on another disk. • DOSKEY Command to view and execute commands that have been run in the past. • DOSSHELL A GUI to help with early MS-DOS users. • DRIVPARM Enables overwrite of original device drivers. • ECHO Displays messages and enables and disables echo. • EDIT View and edit files. • EDLIN View and edit files. • EMM386 Load extended Memory Manager. • ENABLE Recovery console command to enable a disable service or driver. • ENDLOCAL Stops the localization of the environment changes enabled by the setlocal command. • ERASE Erase files from computer. • EXIT Exit from the command interpreter. • EXPAND Expand a M*cros*ft Windows file back to it's original format. • EXTRACT Extract files from the M*cros*ft Windows cabinets. • FASTHELP Displays a listing of MS-DOS commands and information about them. • FDISK Utility used to create partitions on the hard disk drive. • FIND Search for text within a file. • FINDSTR Searches for a string of text within a file. • FIXBOOT Writes a new boot sector. • FIXMBR Writes a new boot record to a disk drive. • FOR Boolean used in batch files. • FORMAT Command to erase and prepare a disk drive. • FTP Command to connect and operate on a FTP server. • FTYPE Displays or modifies file types used in file extension associations. • GOTO Moves a batch file to a specific label or location. • GRAFTABL Show extended characters in graphics mode. • HELP Display a listing of commands and brief explanation. • IF Allows for batch files to perform conditional processing. • IFSHLP.SYS 32-bit file manager. • IPCONFIG Network command to view network adapter settings and assigned values. • KEYB Change layout of keyboard. • LABEL Change the label of a disk drive. • LH Load a device driver in to high memory. • LISTSVC Recovery console command that displays the services and drivers. • LOADFIX Load a program above the first 64k. • LOADHIGH Load a device driver in to high memory. • LOCK Lock the hard disk drive. • LOGON Recovery console command to list installations and enable administrator login. • MAP Displays the device name of a drive. • MD Command to create a new directory. • MEM Display memory on system. • MKDIR Command to create a new directory. • MODE Modify the port or display settings. • MORE Display one page at a time. • MOVE Move one or more files from one directory to another directory. • MSAV Early M*cros*ft Virus scanner. • MSCDEX Utility used to load and provide access to the CD-ROM. • NETSH Configure dynamic and static network information from MS-DOS. • NETSTAT Display the TCP/IP network protocol statistics and information. • NLSFUNC Load country specific information. • NSLOOKUP Look up an IP address of a domain or host on a network. • PATH View and modify the computers path location. • PATHPING View and locate locations of network latency. • PAUSE Command used in batch files to stop the processing of a command. 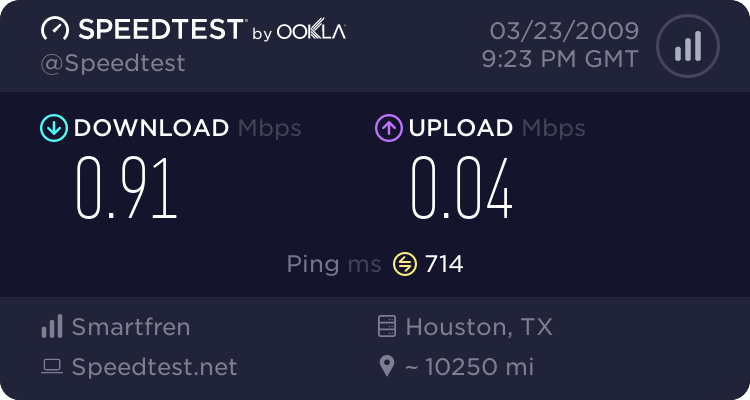 • PING Test / send information to another network computer or network device. • POPD Changes to the directory or network path stored by the pushd command. • POWER Conserve power with computer portables. • PRINT Prints data to a printer port. • PROMPT View and change the MS-DOS prompt. • PUSHD Stores a directory or network path in memory so it can be returned to at any time. • QBASIC Open the QBasic. • RD Removes an empty directory. • REN Renames a file or directory. • RENAME Renames a file or directory. • RMDIR Removes an empty directory. • ROUTE View and configure windows network route tables. • RUNAS Enables a user to execute a program on another computer. • SCANDISK Run the scandisk utility. • SCANREG Scan registry and recover registry from errors. • SET Change one variable or string to another. • SETLOCAL Enables local environments to be changed without affecting anything else. • SETVER Change MS-DOS version to trick older MS-DOS programs. • SHARE Installs support for file sharing and locking capabilities. • SHIFT Changes the position of replaceable parameters in a batch program. • SHUTDOWN Shutdown the computer from the MS-DOS prompt. • SMARTDRV Create a disk cache in conventional memory or extended memory. • SORT Sorts the input and displays the output to the screen. • START Start a separate window in Windows from the MS-DOS prompt. • SUBST Substitute a folder on your computer for another drive letter. • SWITCHES Remove add functions from MS-DOS. • SYS Transfer system files to disk drive. • TELNET Telnet to another computer / device from the prompt. • TIME View or modify the system time. • TITLE Change the title of their MS-DOS window. • TRACERT Visually view a network packets route across a network. • TREE View a visual tree of the hard disk drive. • TYPE Display the contents of a file. • UNDELETE Undelete a file that has been deleted. • UNFORMAT Unformat a hard disk drive. • UNLOCK Unlock a disk drive. • VER Display the version information. • VERIFY Enables or disables the feature to determine if files have been written properly. • VOL Displays the volume information about the designated drive. • XCOPY Copy multiple files, directories, and/or drives from one location to another. Manchester United berhasil memenangkan kejuaraan FIFA Club World Cup 2008 dan berhasil membawa pulang trophy untuk membuktikan bahwa Manchester United adalah tim sepakbola terbaik di dunia. Perjalanan Man Utd dimulai di semifinal saat melawan Gamba Osaka dan berakhir dengan kemenangan Man Utd dengan skore 5-3, kemdian di final bertemu dengan LDU Quito dan menang dengan skore 1-0. Dengan hasil tersebut tidak terbantahkan lagi bahwa Manchester United is the greastest team on earth !! Dengan hasil tersebut berarti Manchester United telah memperoleh tiga trophy di tahun 2008 yaitu: Barclay's Premier League, UEFA Champions League dan FIFA Club World Cup. Glory Glory Man Utd !! 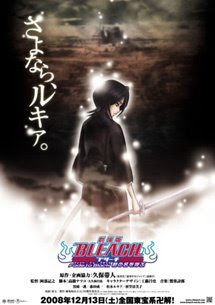 Baru juga beberapa lama Bleach Movie 2 keluar, eh sekarang sudah mau keluar lagi movie Bleach yang ke tiga. Judulnya Bleach: Fade to Black - I Call Your Name. Cerita berawal dari terjadinya ledakan reiatsu misterius yang terjadi di pusat Seiretei di Soul Society yang menyebabkan kehancuran yang besar. Pada waktu yang sama persis, perubahan besar melanda Kuchiki Rukia yang merasa kehilangan sesuatu yang penting dalam dirinya. Urahara Kisuke kemudian mengirim Ichigo Kurosaki ke Soul Society untuk menyelidiki peristiwa tersebut. Setelah sampai di Seireitei, Ichigo diserang oleh para shinigami yang telah hilang ingatan. Seorang diri, Ichigo terus berusaha menemukan Rukia yang hilang dan menemukan penyebab kejadian misterius sebelum semuanya terlambat. Di jepang mungkin sudah keluar ini filmnya, mudah-mudahan bisa cepet-cepet nonton nih.